A 1968 Manchester United Blazer, owned by one of the world’s most accomplished football players the game has ever seen, the late George Best (1946-2005), is to be sold by Bonhams on 13 March in Chester. of the Trafford Hotel in Manchester. Following her husband’s death in 2004, and more recently George’s sad demise in November last year, the hotel’s landlady has decided to sell the Manchester United jacket. The blazer, which features in Bonhams’ Sporting Memorabilia Sale, will be accompanied by a letter, dated 3 October 2004, from the footballer to the hotel’s landlady, which refers to the blazer, and a group photograph of them together with the Trafford Hotel’s landlord. 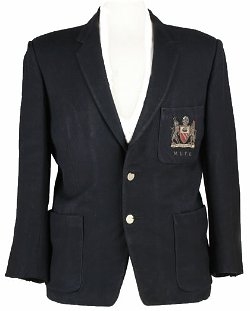 The jacket is expected to fetch between £10,000-15,000. Another ‘George Best’ item in the sale is a signed contract, dated 10 November 1975 for George to play for Stockport County. He played four games for the county, staying with the team for just one month between 26 November 1975 and 26 December 1975. A witness signature of Freddie Pye appears on the document. Well known in Manchester-based football circles, Pye undoubtedly influenced George’s decision to play for Stockport. The contract is estimated at £1,000-1,500. Visit the WCN Sports Collectibles information pages. For more details visit the Bonhams web site.